Tomato based BBQ sauce is what most people associate with what a BBQ sauce should be. There are two sauces we feel are worth having especially if you love pulled pork, the king of sandwiches as far as we are concerned. The other is a vinegar based sauce. 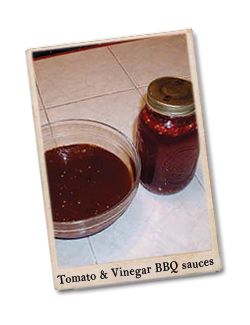 We like both and use both on pulled pork by tossing pulled pork in the vinegar based sauce and topping off the sandwich with the tomato based sauce. Mix together in a sauce pan and heat to simmer. Simmer 20 minutes and let cool. Pour over pulled pork, ribs, BBQ beef or whatever you like BBQ sauce on. Remember when basting with sugary sauces to only bast them the last 5 minutes of the cook time to reduce the risk of burning and becoming bitter. Enjoy!